Determine what VIN / Body Number range was used for each of the relay changes. The TCS (Transmission Controlled Spark) relay was introduced during the 1970 model year. 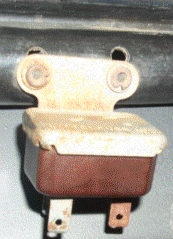 This normally closed relay opened the TCS Solenoid to provide full vacuum to the distributor when the engine was cold. two types of relays used. The 3983958 and the 3961573.
two different mounting methods for each different relay. On the firewall and on the wiring gutter. 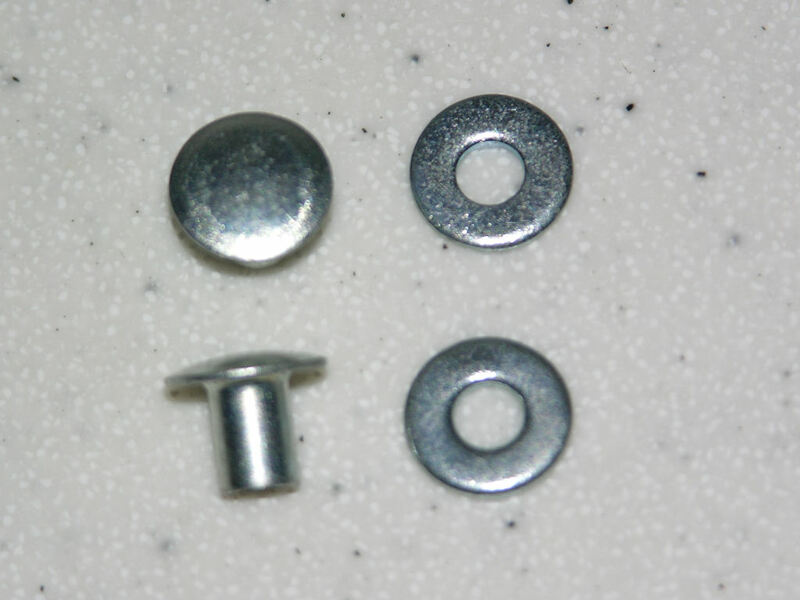 three different fasteners used. Rivets, Screws, and plastic clips or plugs. Simply, the relay was used in conjunction with a transmission switch, a vacuum solenoid, and temperature switch. It varied the amount of vacuum sent to the distributor to aid emissions. 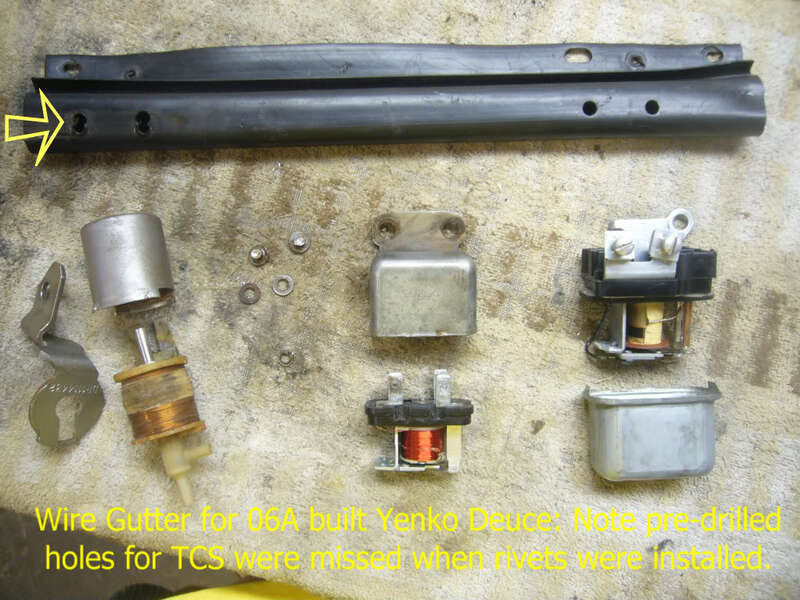 Here is a short set of pictures that details the Nova TCS Relay, Wiring Gutter and the Rivets that fasten them together. 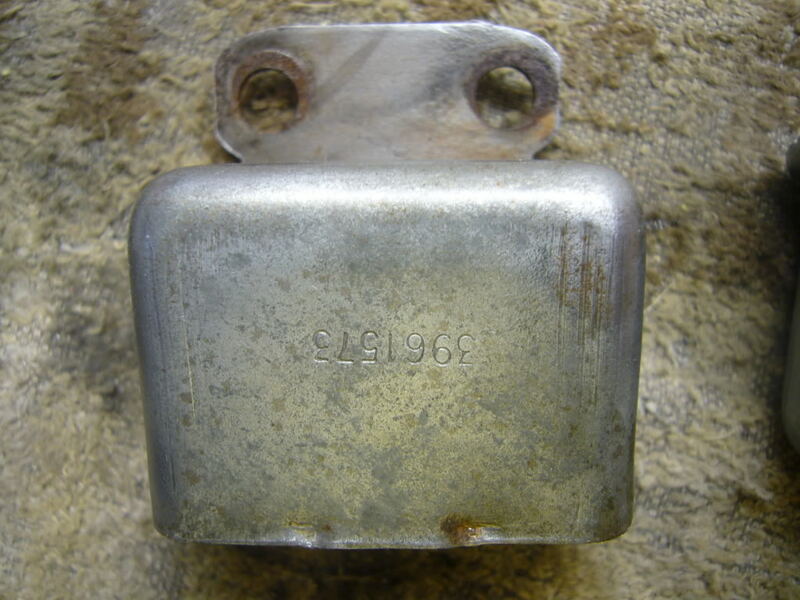 This first sections covers the small TCS Relay 3961573. I do not have a large one yet. This style relay was interchanged with the larger 3983958 relay. I have not figured when they were switched or when or why they were screwed to the firewall. 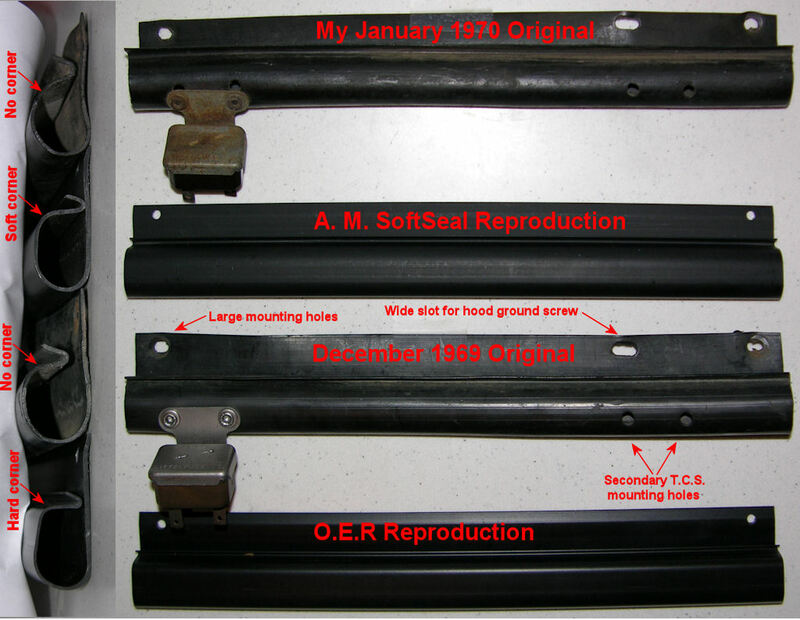 The first picture shows two OEM gutters compared to the two available reproductions. The reproductions do not have the holes punched in them. The holes can be punched with a leather punch, the same goes for the radio ground slot, just use a buckle punch. The holes across the top are the following sizes. 3/16" x 5/15" for mounting to the firewall. The slot for the radio hood ground is 1/4" x 1/2"
The relay mounting holes are 1/4" in diameter. Punched 1 1/8" on center a part. The left set are 7/8" from edge to center. The Right set are 2" from edge to center. Note the curve in the OEM gutters and the corners in the reproductions. Below is a close up of the relay and the rivets. The relay on the left was media blasted and is bare metal. The one on the right is the original Cadmium plating with the rust patina. The left one was riveted in the holes exactly. The right one is the typical mis-punched installation. 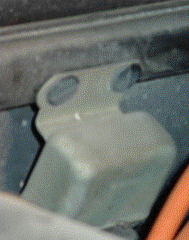 Note the plastic still in the tubular rivet. The relays date coded with very small numbers stamped into the case. The right one dated 12-9 was installed the 2nd week of January 1970. 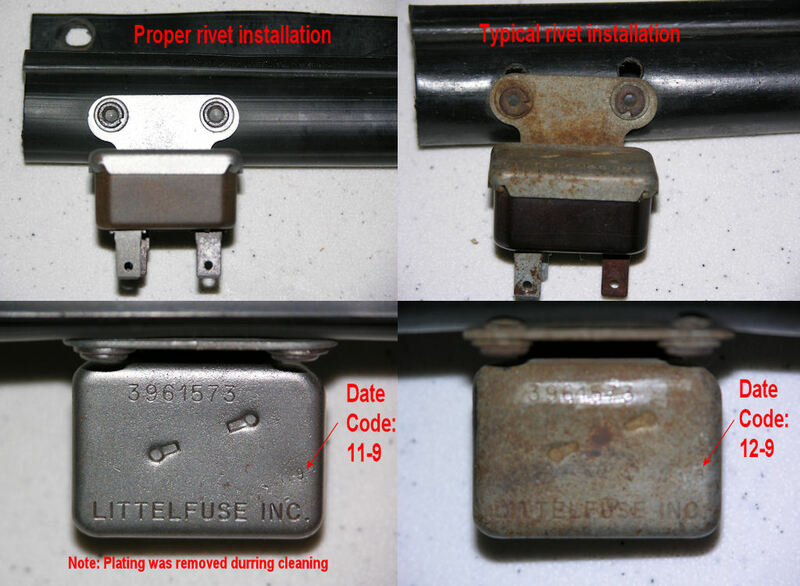 Below are close ups of the OEM rivets and the replacement rivet and washer. The washer ID is a bit small and needs to be drilled out to fit on the rivet. The thickness of the washer varied. This was due to supplier variances. 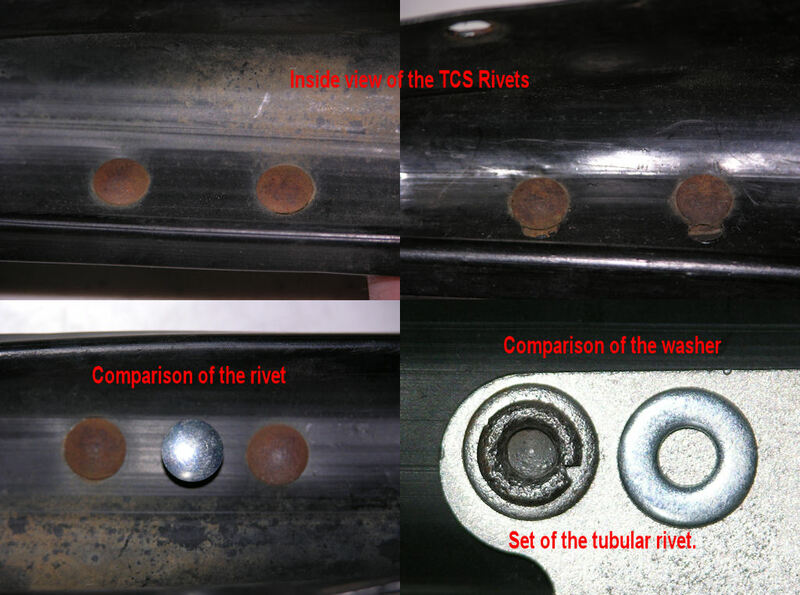 Below is a large picture of the TCS rivets and washers. 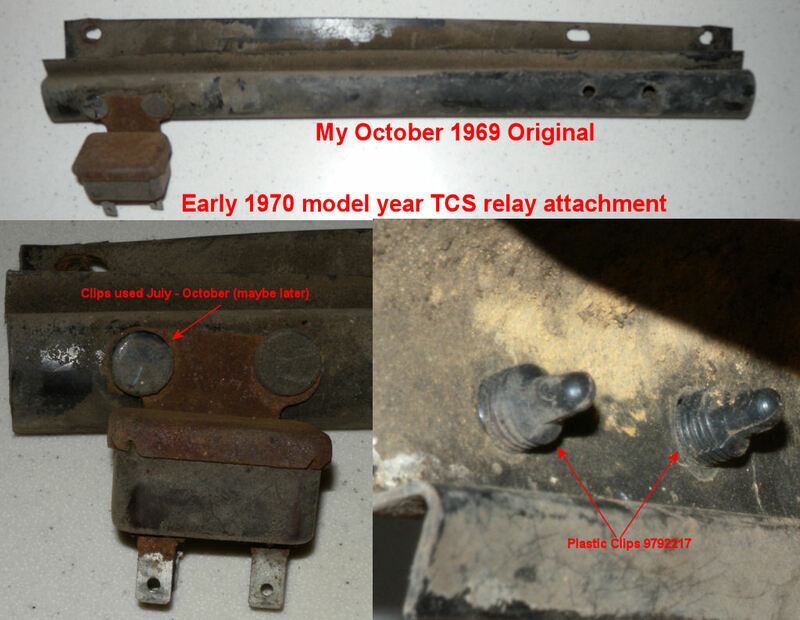 Below is an example of the early TCS relay with the plastic clips used to attach it to the gutter instead of rivets. The Normal Observable Practice shows most all early 1970 model year Novas had the clips until around December of 1969. Below is a set of pictures from Sam "mockingbird812" at the Supercar & musclecar Bulletin Board showing the "Big" Style 3961573 Relay. 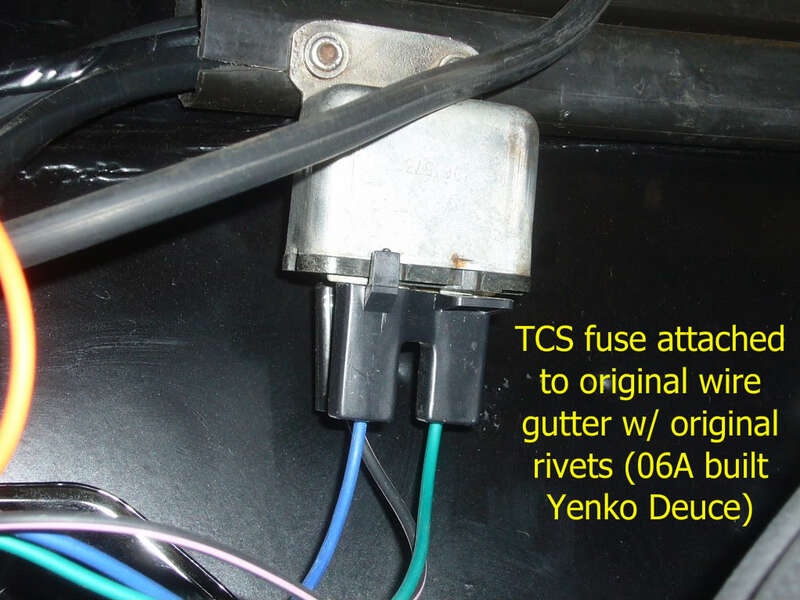 I'll reinstall this TCS fuse with Greg's rivets, washers, and special tool (Click here to see how Sam installed the rivets) to a better condition wire gutter as compared to my original wire gutter. Case went to a local plater for zinc finish to replicate original cadmium plating. If you find something other than what is listed here. Please take a minute to post a note on the Supercar & musclecar Bulletin Board. This Research Project relies on accurate facts gathered from people like you. These facts will be added to our database and used for statistical analysis. NO unique car or personal information will ever be released! © 2004-2013 Gregory L. Roberts, Inc. All rights reserved unless expressly stated otherwise.